■ Careful preoperative planning regarding the approach, number, size, and placement of cryoprobes is advantageous. ■ The specific choices of probe number and size depends on the size and site of the renal mass lesion. ■ Hilar lesions, lesions close to pelvi-caliceal system and cystic lesions are generally avoided in our practice. ■ Liberal use of intraoperative ultrasound imaging by an experienced radiologist is very valuable in localizing the lesion and to rule out multicentric lesions. ■ Adequate mobilization of kidney and exposure of renal mass makes subsequent planning and placement of cryoprobes safer and more reliable. ■ The importance of placing more than one cryoprobe to achieve adequate coverage of the whole tumor could not be over emphasized. We believe most of the recurrent tumors are persistent tumors, which were missed in the earlier freezing. ■ We also believe that a margin of 10 mm is necessary to achieve adequate and dependable cell death. ■ We routinely perform double freeze and thaw cycles of 10 minutes duration each to achieve our goal of complete destruction of malignant cells. ■ Venous bleeding is usually encountered and can be controlled by pressure, packing with surgicel and fibrin sealants. ■ Adequate hemostasis should be ensured at intra-abdominal pressures of 5 mmHg before concluding the procedure. ■ Patients should be advised to avoid strenuous activity for the next two weeks to prevent postoperative hemorrhage. Complications of renal cryoablation are similar to partial nephrectomy, but special precautions should be taken to avoid unnecessary morbidity. Renal lacerations, perinephric hemorrhages, liver laceration, pancreatic injury, ureteroelvic junction stricture, and complete bowel obstruction have been reported. underwent nephrectomy and one patient had change of mental status secondary to narcotics. Three patients died of unrelated causes. Three lesions showed peripheral enhancement at the previously cryoablated site. One patient with peripheral rim enhancement with an increase in size of the cryoablated site with nodular enhancement in the subsequent follow-up scans and biopsy consistent with active disease underwent partial nephrectomy. The other two patients had no further nodular enhancement with decrease in size of the cryoablated site (25). Gill and coworkers (23) reported their three-year follow-up of laparoscopic renal cryoablation in 56 patients. All patients were treated with a double freeze-thaw cycle, under laparoscopic and ultrasonographic guidance. Follow-up consisted of magnetic resonance imaging on postoperative day 1 and at months 3, 6, 12 and semiannually thereafter until the cryolesion was no longer visible. In addition, computed tomography guided biopsies of all patients were performed at six months postoperatively. Mean patient age was 65 years. Mean preoperative tumor size was 2.3 cm (range, 1.5-3.7). Follow-up biopsies post cryoablation showed residual tumor in two patients (3.6%). New renal lesions developed at a different site in 3 patients (5.4%). At three years the overall patient survival and cryoablation-specific survival was 89% and 100%, respectively. A meta-analysis of the clinical laparoscopic cryoablation series reported so far showed that the mean tumor size was between 2.0 and 2.54 cm (10,16-23). The recurrence rate is low, anywhere between zero and two cases per series. Shingleton et al. (26) reported their experience and analyzed the possible causes for the persistence of the tumor (14%) requiring retreatment. Large tumor size and tumor masses abutting the pelvi-calyceal system or the renal vessels were found to be the major causes of failures. Tumor size (2/14) and location (11/14) were found to be the most important factors leading to treatment failures. Complications of renal cryoablation are similar to partial nephrectomy, but special precautions should be taken to avoid unnecessary morbidity. Renal lacerations, perinephric hemorrhages, liver laceration, pancreatic injury, ureteroelvic junction stricture, and complete bowel obstruction have been reported (9,12,18,19,27,28). The cytocidal effect and durability of cryoablation appears promising. However, the ideal cryogenic probe system and optimal mode of delivery have yet to be defined. Intra and extracorporeal monitoring of cryolesions is still evolving and its accuracy is dependent on the skill and experience of the surgeon. There are not enough data regarding the treatment of tumor margins in the larger lesions and the safety of cryoablation for the lesions near the collecting system and renal hilum. The next major challenge is the evaluation of clinical results. Limited postcryoabla-tion imaging and biopsy results have been reported. Decrease in size of the tumor/absence of growth and lack of enhancement on computed tomogram/ Magnetic resonance imaging may be viewed as oncological success. Rukstalis et al. 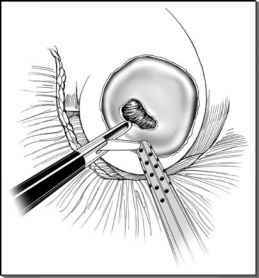 (9) recommend routine follow-up biopsy although to date only six months biopsy data are available. Serial biopsies at regular intervals are ideal but an optimal biopsy schedule is yet to be determined and biopsies are not without sampling errors and patient morbidity. Computed tomography-guided percutaneous cryoablation is also available in many centers.